One of the finest "adventures" Mexico has to offer (at least in my opinion) is their fabulous food! Of course, with a complete and fully equipped kitchen in your villa, you could do all your own cooking while staying at the Royals. But you really should try out at least one of the outstanding Royal restaurants. I also suggest you don't miss out on the superb hospitality, cuisine and variety offered in the downtown area restaurants. "Entertainment Plus" two for one card. You'll find it useful for more than your dining adventures too! Tulum, a lovely place to spend a day! Exploring ancient ruins is a favorite adventure of mine while in Mexico. If you stay at the Royal Mayan you will surely want to explore El Rey, an excavation site within walking distance of the Mayan. Then you'll want to see more! Only about two hours down the coast from the Mayan is Tulum. This is a beautiful site with enough to keep you busy for a day. Be sure to take your bathing suit, as there is a nice little beach there too. To really get a feeling for the grandeur of Mexican history take a tour to the ruins at Chichén Itzá . You can rent a car and drive yourself, but I recommend a tour bus, at least for your first visit. For an at home tour of Chichén Itzá here are a couple of great links. I also highly recommend an excursion to Sian Ka'an. But do take the guided tour! Go it alone and you'll miss most of the fun! 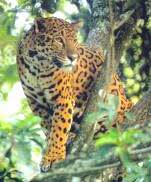 Here is a link where you can find out how to help save some of Mexico's wild land and endangered species. A very small amount helps save an acre for these beautiful creatures.